Heading back from the sell-out success of the Glasgow Frightfest, I’m struck by how inappropriate the brand-name can be, for there were few traditional ‘horror’ films here as such. Rather, we were offered plenty of clever, well-directed movies – crime, thrillers, even SF, that would fall between the cracks in general distribution. Low budget independent films need to rely on something other than jaw-dropping effects, so they offer originality, surprises and twists galore. It’s a great festival, held in an elegant cinema that appears to be unchanged since the 1930s. Glaswegians love to talk – and talk intelligently – about film, so you cannot help but end up listening and sharing your views with everyone. So to the best films to watch out for. ‘Crawl’ is an Australian film modelled a little too closely on the Coen Brothers’ ‘Blood Simple’, but offers an alarming performance from a smiling elderly Croatian hitman who accidentally interferes with a waitress’s wedding plans. ‘Wang’s Arrival’ (Ditch that title) was a nice idea; an Italian translator of movies is hired to speak Mandarin Chinese to a special government detainee – an alien who has landed by mistake in Rome, where he can’t be understood. He chose to learn Chinese because, logically; ‘It’s the most popular language on Earth’. Quickly the liberal interpreter realises that she is at odds with the belligerent interrogator. The film is let down by slow pacing and a twist ending that telegraphs itself, but is very watchable. If we’re going to have another ‘found footage’ film, let it be ‘Evidence’, in which the usual gaggle of teens heading into the woods establish themselves with surprising charm before being decimated by what at first appears to be an escaped gorilla. What they’ve actually stumbled upon is far worse – great fun. ‘Penumbra’ was my favourite. An argumentative (and hilariously insulting) young businesswoman from Barcelona arrives in Argentina to rent out her mother’s old flat and meets the estate agent and his strangely twitchy clients at the apartment building. There’s a total eclipse coming, and as she waits to sign the deal the mood becomes very uncomfortable. Why is they prepared to pay four times the normal fee? What’s in the potato sack in the locked room nobody can find the keys to? Then the businesswoman gets a call from the agent saying he’s sorry he couldn’t make it today…at which point the plots takes a mad left-turn. Think the wonderful ‘La Communidad’ crossed with ‘The Devil Rides Out’. And watch out for the tropical fish and the teabag! Low budget can still mean jaw-dropping, as director Gareth Huw Evans proves with the astounding martial arts fest ‘The Raid’. The plot is pure Carpenter – police decide to take out an apartment building run by a ganglord where the residents live in fear – and one rookie ends out clearing it floor by floor. It’s hard to convey the sheer level of energy and intensity this film possesses – it makes ‘Assault on Precinct Thirteen’ look like ‘Tree Of Life’. This is the kind of film where someone makes a makeshift bomb by tearing a gas canister from a wall, shoving it in a fridge and pushing the whole lot out of the window. In one fight sequence the protagonists fall the height of the building, scrapping all the way down. Evans discussed how he achieved effects we have simply never seen on a screen before – ‘we threw the camera to each other’ – reminding me of the young Sam Raimi, who said something similar. Bravura, thrilling film-making, with a star turn from Iko Uwais, who gave us some martial arts moves after the film once he had carefully laid out the contents of his pockets in a neat row. In the US the film is to be cut and will have its excellent soundtrack replaced by someone from Linkin Park, which is a shame. See it before it gets messed about with. 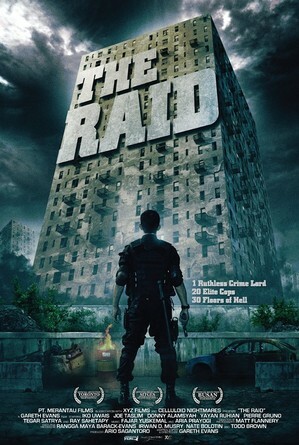 I saw a trailer for The Raid a while back, it does look like fun.